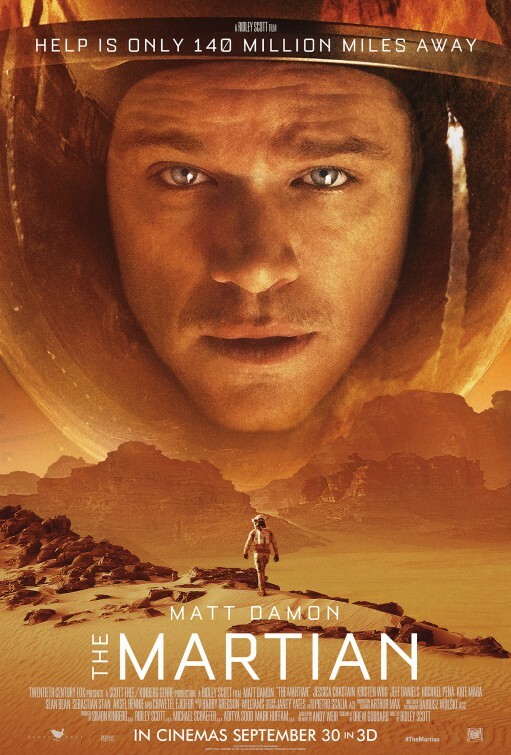 Based on the novel by Andy Weir, The Martian tells the story of the Ares III: a manned mission to Mars crew, who are monitoring samples for a simple thirty day period. The film wastes no time getting straight into the story with an anticipated storm accelerating toward the temporary habitat. Believing that the Mars Ascent Vehicle (MAV) will tip and the crew will be unable to leave the red planet, Commander Lewis [Chastain] orders the evacuation. When the storm hits, it wreaks havoc and an antenna dislodges itself, killing botanist Mark Watney [Damon]. With the weather intensifying, the crew are forced to abandon Mark’s body and leave Mars. Back on Earth, word gets out and with NASA being a publically owned company, they are legally required to publicise all findings within a 24 hour period, leading to NASA Director, Teddy Sanders [Daniels] announcing Mark’s death to the world. It is at this point that we learn that Watney is very much alive, pierced and bleeding but alive. He makes his way back to the habitat and begins logically analysing his chances of survival. After a month of rationing and restocking the facility, Mark’s actions are witnessed by satellites and so the race to somehow save Mark begins. Fiscally and critically speaking, 2015 has already been a great year for cinema and it’s been a welcome treat to have such high calibre blockbusters and independent releases. Admittedly, Ridley Scott has not made himself a safe bet of late. Much like some of the finest directors of the 70’s and 80’s, their more recent efforts have failed to captivate or impress. Scott has produced a few half decent releases but also a fair amount of misses which seem wholly beneath his talent. Thankfully, The Martian is a glorious return to form. Masterfully directed, wonderfully edited, great acting, impressive production design, brilliant cinematography; it’s an all-round success in my eyes. What’s also interesting is the sheer cinematographic range utilised. Too many people try to emulate the look of phones and found footage on high spec cameras and then actively degrading the footage. The Martian makes the simple and smart move of just using the technology available. Need a go-pro shot? Use a go-pro. The look and feel work for the narrative and put the audience in a very real place, free from the sheen and perfection of a refined high definition shot. And it’s decisions like this that feel more in line with the upper echelon of Scott’s body of work. While this is probably already apparent, allow me to highlight something. When a film goes into production, there is an exceptional amount of research and prep into the look and feel of the aesthetic. For a science fiction film, this can double depending on how scientifically accurate the director wishes to be. Now, if you’ve shot a science fiction film with a few steps in reality, chances are a lot of your previous research will still be relevant. As such, The Martian shares a lot of common visual and audio aspects Alien and more specifically Prometheus. A lot of people will be put off by that sentence but I think we can all agree that the aesthetic design of Prometheus was amazing. Subsequently, the suits, sound effects and shots focusing on isolation and scale all feel reminiscent, albeit with a warmer hue. The only way this film would work is with an immensely magnetic and charming lead able to convey a range of emotions, keeping the audience rooted and hopeful. Much like, Tom Hanks in Cast Away (and Tom Hanks in Apollo 13 if I’m honest), without that energy and charisma, the audience will turn on you and either a.) grow bored or b.) root for your death. Matt Damon is a great acting talent (regardless of the public parroting his 2004 parody) and the humour, optimism, affability and endurance is so gosh-darned life affirming in a way that so many try to emulate and few ever achieve. The supporting cast also offer a huge amount of narrative relief despite the fact that they are, in of themselves, utter cheeseballs. I berated Interstellar for being fast-food cinema posing as high-brow and while this film suffers the same affliction, without the understated pretention, sells these stereotypes with greater success. Case in point, I’m pretty sure the supporting roles (maybe even some of the dialogue used) wouldn’t be out of place in something like Armageddon or Space Cowboys. There’s not a single ‘bad guy’ and everyone serves a very two dimensional purpose but they’re written with such realism and chemistry that you automatically dismiss that they are all basically walking stereotypes. On top of that, the convenience factor is the film’s only real problem. Everything is very straightforward, even with the cataclysmic developments and this means that in retrospect, Mark was never in any real danger. But that’s only under scrutiny, at the time, unbeknownst of the outcomes, you are emotionally committed and gripped from start to finish. I’m going to be straight with you guys, this is a complete cop-out. Not only that, it’s a real injustice to the countless moments, developments and interactions with this film is packed with. There is a full circle moment in certain movies when pop culture is openly referenced. In this case, The Martian is an adaptation and few studios would openly acknowledge existing material which contradicts its own existence. To explain, there are references to both the Marvel Cinematic Universe and The Lord Of The Rings. This is particularly amusing as the very scenes in question feature Michael Pena and Sebastian Stan (Marvel regulars) and Sean Bean (who sat on the very council the story alludes to). I have no conclusion to this thought, whether it’s a positive, negative or I’m just overthinking it but it tickles me and I thought I’d share it with you. Putting the exceptional Mr. Damon to one side for a minute, let’s have a look at that extensive supporting cast. As stated earlier, these individuals are a touch archetypal but that’s not to say there aren’t some really well acted performances here. I love Benedict Wong and although he’s given the typical Star Trek engineer role (“Two days!? I need at least a week!” etc) he performs wonderfully. The same goes for Kristen Wiig as the level headed, no-nonsense PR specialist or the pragmatic but completely invested director played by Jeff Daniels. Every component is perfectly cast to the degree that you are sold left, right and centre. And that is an incredible feat. 1. What is the name of the annual child murdering contest in The Hunger Games? 2. Which film features Dorothy, Toto, The Wicked Witch Of The West and Professor Marvel? 3. Which actor starred in Commando, Jingle All The Way and Terminator Genisys? 4. What is the name of the character played by Bruce Campbell in The Evil Dead? 5. 1971 saw the release of Stanley Kubrick’s only x-rated film, what was the title? 6. What animal is Bagheera in The Jungle Book? 7. The following is the poster tagline for which film, “An adventure 65 million years in the making”? 8. The following quote is from which film, “Here’s looking at you, kid”? 9. Which series features the characters Dominic Toretto, Letty Ortiz, Luke Hobbs and Brian O’Connor? 10. What did Pixar release after Ratatouille but before Up? 1. The Notorious Bettie Page is about the life of which 50’s pinup? Marilyn Monroe? Bettie Page? Betty Grable? 2. Which of the following did not appear in The Brothers Grimm? Tobey Maguire? Matt Damon? Heath Ledger? 3. E. Edward Grey is the main character in which film? 50 Shades Of Grey? Secretary? Venus In Furs? 4. Which film won the Grand Prize Of The Jury, Best Actor and Best Actress at the 2001 Cannes Film Festival? No Man’s Land? Human Nature? The Piano Teacher? 5. How many actors have played the role of M in the Eon James Bond films? 4? 5? 6? 6. 1975’s Salo: 120 Days Of Sodom was produced by and set in which country? Sweden? Italy? Turkey? 7. The following quote is from which film, “Conversation, like certain parts of the anatomy, always run more smoothly when lubricated”? Panic In Motion? Marquis? Quills? 8. What was the budget for Blue Velvet? 6mil? 22mil? 89mil? 9. What is the full title of John Wilmot, Johnny Depp’s character from The Libertine? 6th Earl Of Dorset? 2nd Earl Of Rochester? 1st Earl Of Clarendon? 10. All the brothel scenes in 1967’s Belle De Jour are tinted blue. True or False? 2. The three Sanderson sisters in Hocus Pocus are played by Bette Midler, Kathy Najimy and which other actor? 3. Duloc is the fictional setting for which film? 5. Robert De Niro, Bela Lugosi, Kevin James and Aaron Eckhart have all played which literary character? 6. In which film did Tom Cruise play the role of a racecar driver named Cole Trickle? 8. What did David Lynch direct in 1980? 9. What is Carrie’s surname from the film of the same name? 1. What was Alfred Hitchcock’s highest grossing film at the box office? The Birds? Rear Window? Psycho? 2. The following quote is from which film, “Death smiles at us all. All a man can do is smile back”? Gladiator? Spartacus? Ben-Hur? 3. Who directed 1900, Last Tango In Paris and The Last Emperor? Wim Wenders? Jean-Pierre Dardenne? Bernardo Bertolucci? 4. How many Halloween films have been made (excluding the remake and its sequel)? 8? 10? 12? 5. Which of the lead minions from the Despicable Me series has one eye? Kevin? Stuart? Bob? 6. In the live action Disney release, Maleficent, what type of bird is Maleficent’s spy and confidant, Diaval? Crow? Raven? Vulture? 7. Which of the following is not a Woody Allen film? Heart Of Glass? Cassandra’s Dream? The Purple Rose Of Cairo? 8. How many years passed between the release of The Blues Brothers and Blues Brothers 2000? 18? 20? 22? 9. Who composed the score for Argo? Alexandre Desplat? Harry Gregson-Williams? Trevor Rabin? 10. Steven Spielberg chose to shoot the majority of E.T. from the eye-level of a child, to further connect with Elliot and E.T. True or False? Owing to its length, content and simple narrative, Macbeth is arguably the Shakespearean play best suited for cinematic adaptation. As with most of the bard’s surviving works, there have been countless adaptations over the years with all manner of interpretations and representations. As a life-long Akira Kurosawa fan, Throne Of Blood is my personal favourite. But coming in a close second is easily this fine release. As such, I should warn you in advance, this review is going to be a gush-fest of praise. From the central elements to the minute details, everything is wonderful. If you are unfamiliar with the play, the plot is very straightforward. Macbeth [Fassbender] is a loyal subject of the Scottish king Duncan [Thewlis]. After winning a great battle for his lord, Macbeth and his colleague Banquo [Considine] encounter a group of witches who prophesise that Macbeth will become King of Scotland, while Banquo’s heirs will be king, though he will never be. It’s a cryptic message that the friends laugh off but when an element of the prophecy immediately comes true, they grow curious. 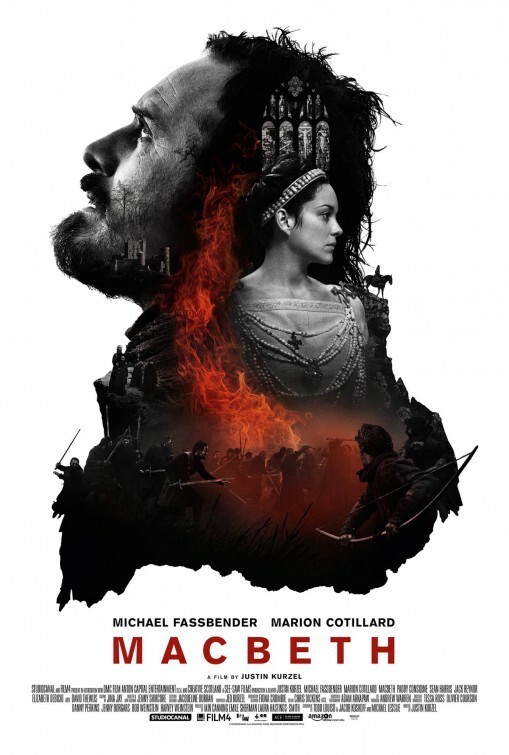 Macbeth’s wife, Lady Macbeth [Cotillard] believes the omen and presses her husband to act upon it. Hungry for power and loyal to his wife, Macbeth kills Duncan and is quickly crowned king. From here the couple grow suspicious that they will be caught or usurped from the throne, leading both of them to insight a bloody reign, executing all those who would oppose or question Macbeth’s rule. First thing to note is that there are surprisingly few Scots in this ‘Scottish film’ but everyone does such an astounding job that it’s hard to genuinely discredit them for it. As with a lot of Shakespeare, the two leads own the entire film. They occupy almost every scene and the real meat of the memorable dialogue and powerful scenes are awarded to them. Meaning, it’s impossible not to talk at great length about these two pivotal roles and the weight of expectation laid upon these thespians is not only a substantial one but has been embodied and reinvented multiple times over hundreds of years, worldwide. Michael Fassbender’s Macbeth is a very internalised interpretation. All the rage, paranoia, guilt and confusion is there but it’s neither hammed up nor extravagantly presented (the pitfall of all actors attempting Shakespeare). Haunting, self-contained and teaming with passion, it’s an absolutely fantastic portrayal. Sharing equal praise is Marion Cotillard’s version of Lady Macbeth. Again, the power hungry scheming which gives way to doubt and fear is all there but is also devoid of woeful embellishment. This feels like a very real manifestation of a potentially very caricatured individual. To my mind, this is probably the best I’ve seen from Cotillard and will be hard to top. As stated, the supports largely boil down to two or three roles but in all honesty absolutely everyone, whether they have dialogue or not, is phenomenal. The extras embody the faceless hordes that initially stand behind Macbeth then in between him and his ambitions, those put to the sword in the mad king’s reign of terror display genuine fear of death and the state of their country and his closest allies and rivals convey a wealth of suspicion and distrust in simple expressions and exchanges. Going hand-in-hand with the superb acting is the troika of cinematography, editing and direction. This film is a visual delight. The cinematography is inventive and marvellously crafted, making use of natural light, candles and crepuscular rays to great effect. The editing is also very interesting, repeating and reliving key moments in the story as a representation of the lead’s internal dialogue, heightening the madness and insecurities. All of which is brought together by utterly masterful direction. Combining independent, mainstream and art-house concepts to produce something worthy of Kurosawa himself. Kurzel commands great understanding of visual cinema and like Kubrick or Anderson ensures that every single frame is a painting, imbued with depth, emotion and visceral beauty. With these elements firing on all cylinders it would be easy to sully the whole thing with inferior audio work. Thankfully the sound design is rich and the score is simple but completely haunting, grand and vastly encompassing; both linking and owning everything it accompanies. On top of everything else, the film is graced with spectacular production design. The hair and makeup are gritty and real, giving everyone a dishevelled un-madeup look. The sets are rustic and simple, trying to strike a balance between historical accuracy and visual resplendence. The costumes too, feel real and battle-worn, combining simple fabrics and designs to make very plausible attire. Characters are adorned in matching shorn hair and thick beards, rather than the long braided ginger hair and kilts that most adaptations north of the border tend to adopt. And although it’s not an element that can be controlled, the choice to film in Scotland and England ensures that the weather plays a key role in the setting. The rain, fog and wind creep into every shot without feeling false or synthetic. And with a feature like Macbeth which draws heavily on the cold, bleak but undeniably beautiful Scottish terrain, it’s vital for authenticity. I always like to balance out an extremely positive review with at least some form of negative aspects highlighted but in truth, the only problems I can see this film having are with specific types of audience members. There are those who will claim they can’t understand the language or the accents, Shakespeare purists who won’t care for the abridged dialogue and those who won’t like the way in which the film is presented. But to my mind, these are not problems with the film but with potential audience perceptions. Macbeth is eloquent cinema and deserves every ounce of praise I have to offer. For those familiar with the source material, Lady Macbeth’s “out, damned spot” speech is a quintessential one and probably the most famous part of the play. It’s the moment when the woman who has had nothing but confidence and given nothing but assurance that her husband has performed his duty, loses faith and in many adaptations begins scrubbing at her hands or roaming the castle, hands raised, wailing maniacally. The approach here, however, is extremely novel and what’s more very powerful and incredibly beautiful, despite being a single uninterrupted shot. Wondrous acting. Sean Harris is a great talent. For lack of better phrasing he has one of those faces that directors love to work with and a piercing stare that intimidates everyone around him. Despite being slightly small in stature, his portrayal of Macduff (Macbeth’s biggest threat and outright opposer) is a menacing one. Macduff isn’t the gentle prince, nor is he a callous murderer. This is a family man driven to vengeful rage, a noble warrior void of the desire to sit upon a throne. And Harris captures all of this brilliantly. Before He Was William Shakespeare, He Was Just.. Historically speaking, there is a fifteen year period in William Shakespeare’s life which has next to no surviving evidence. As such, this period has been dubbed Shakespeare’s Lost Years. Subsequently there has been all manner of speculative fiction attributing various claims about how one of England’s most well-known citizens came to prominence in London. Bill takes it upon itself to offer yet another hypothesis, albeit leaning heavily on the silly side. The film opens with the King Of Spain [Willbond] capturing Sir Richard Hawkins [Damian Lewis] and offering to return him unharmed to England. This is all a ruse, however, as the King intends to bring an group of Spanish mercenaries with him to execute Elizabeth I [Helen McCrory]. While this is going on, we are introduced to William Shakespeare, a musician who hasn’t been enjoying much success in his home of Stratford-Upon-Avon, leaving his wife and children, he heads to London to make his fortune as a writer. 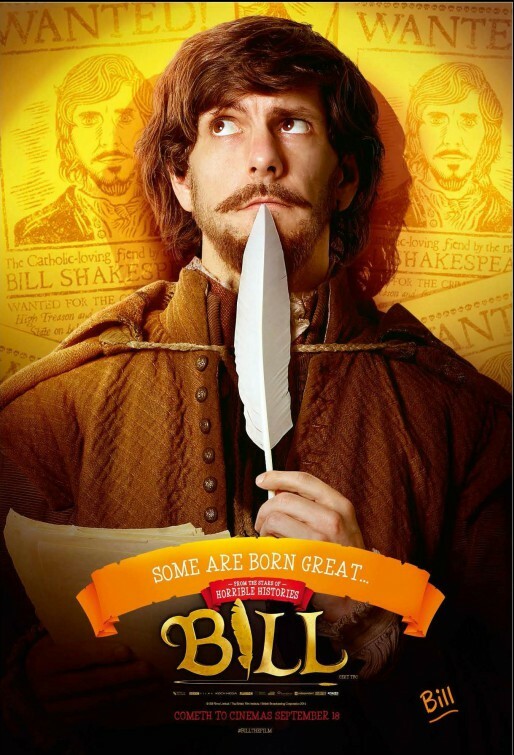 Due to a series of events, Bill ends up being contracted by the Earl Of Croydon [Farnaby] to write an amazing play to dazzle the Queen and her guest, King Philip II of Spain. It should be noted that despite my final score, I did actually enjoy this film. I really like the creative team and there’s as many laughs as there are duds but as a film, it’s not brilliantly crafted and felt like a rewrite away from being something really special. The lead six actors (listed above) are best known for working on Horrible Histories and Yonderland; both of which are exceptionally well made, funny and intelligent. As such I had rather high hopes for this release. As with the aforementioned projects, the production design is of an extremely high calibre: the costumes, hair, make-up, sets and locations are all exemplary. The music is fitting but ultimately a touch too characterless to really stand out. In all honesty, from a technical standpoint, it’s a very functional film, the editing and cinematography are commendable, the editing is decent and the sound design works well. Ultimately, the problems really stem from the writing. The whole thing was very reminiscent of Blackadder Back And Forth. For those who don’t know, Blackadder was an amazingly witty and funny historical British TV series which ran for four seasons. Having been off the air for quite some time, they shot a half-an-hour special to celebrate the millennium. All the cast and crew were reunited but the finished product lacked a certain something. The production levels were all acceptable but the writing fell flat and the overall experience was marred by previous successes. Thankfully Bill doesn’t wade hip deep in the usual fare that family films traipse happily into – fart jokes, I’m looking at you – but it lacks any bite or enough substance to really stand out as something of true merit. I can only hope this is just their first foray into film and that in future something of greater substance can be produced. One of Rickard’s many roles is that of Sir Francis Walsingham, who is played as a paranoid zealot, convinced that Catholics are continually plotting to subvert and overthrow the good, Protestant English way of life. Amusingly they are but his absurd hatred of them is quite entertaining, filled with contradictory statements and suspicion of everyone. Not to mention the fact that Walsingham was dead at this point, so every time he turns up in a pie or under a pile of bodies, he’s greeted with looks of surprise. Kind of like Chief Quimby in Inspector Gadget. It’s just a nice little running joke and Walsingham’s manic obsession is nicely played out by Rickard. In the vein of Monty Python, the troupe play (almost) all the lead and supporting roles in various guises so there is a wealth of performances to choose from. For me, however, the two standout characters are Howick as Christopher Marlowe and Willbond as King Philip II Of Spain. Marlowe’s penning of Faust has pretty much defined how he is portrayed throughout time and this case is no different, he makes a deal with the devil and gets burned; surprise surprise. But I found Howick’s performance endearing, especially his inability to grasp comedy, constantly trying to get a handle on “your mum” as a joke. Willbond’s Philip is equally hilarious, opting to portray the king of Spain as a cruel and cunning monarch but also a completely ineffective moustache-twirling villain with useless henchmen. Charming, funny and enjoyably wicked. Genre – We will not change our name! Genre – We are not miserable, we are quizzable! 1. What was the title of the 2004 Jonathan Frakes film, based on the Thunderbirds TV series? 2. What is the nationality of director Jean Pierre Jeunet? 3. What is the title of the sequel to Jurassic Park? 4. What make of car is used in the robbery in The Italian Job? 5. Who played the lead role in The Truman Show? 6. How many individuals make up The Avengers (in 2012’s The Avengers)? 7. According to the episodic chaptering of the Star Wars saga, which episode is Return Of The Jedi? 8. Which film starred George Clooney, Mark Wahlberg, Ice Cube and Spike Jonze? 9. Disney’s The Sword In The Stone is based on which legendary king? 10. Which sequel did Tom Hanks star in, in 2010? 1. Which of the following films is set in a prison? It’s A Wonderful Life? Once Upon A Time In The West? The Shawshank Redemption? 2. Who directed The Godfather ? Brian De Palma? Francis Ford Coppola? Martin Scorsese? 3. The Godfather: Part II was released in which year? 1974? 1975? 1976? 4. Which of the following quotes does not feature in The Dark Knight? You need an ace in the hole. Mine’s Harvey? You know, for a while, I thought you really were Dent? When you and Dent cleaned the streets, you cleaned them good? 5. In the script for 12 Angry Men each member of the jury has a number, what number is assigned to Henry Fonda’s character? 3? 8? 12? 6. Schindler’s List was nominated for twelve Oscars (of which it won seven). Which of the following categories did it gain an award for? Best Original Score? Best Supporting Actor? Best Costume Design? 7. Which song do Vincent and Mia dance to at Jack Rabbit Slims in Pulp Fiction? Lonesome Town? Let’s Stay Together? You Never Can Tell? 8. At the start of The Good, The Bad & The Ugly, Blondie hands Tuco over to the Sheriff for a bounty of how much? $1000? $2000? $5000? 9. Which character said the following, in The Lord Of The Rings: Return Of The King: “I didn’t think it would end this way”? Pippin? Theoden? Faramir? 10. The narrator’s various aliases in Fight Club are all named after Roman emperors. True or False? 2. Who directed Red Eye? 3. How many films has M Night Shyamalan directed, including 2015’s The Visit? 4. The following individuals are all Oscar winners but what is their job title: William Goldenberg, Angus Wall, Kirk Baxter, Thelma Schoonmaker, Jamie Selkirk and Michael Kahn? 5. Hammer Studios is a production company founded in which country? 6. The following quote is from which film, “Tell me your story, Max. Come on. What burned you out? Kill one man too many? See too many people die? Lose some family?”? 7. Who featured in the following films: Annie Hall, Invasion Of The Body Snatchers, Silverado and Independence Day? 8. Who directed Where The Wild Things Are? 9. The Iron Giant is set in which year? 10. During production on the 1995 film Friday, cast and crew were recommended not to wear which colour; to avoid gang altercations? 1. Which of the following is not a Palm d’Or winning film? Roman Polanski’s The Pianist? Michael Moore’s Fahrenheit 9/11? Gus Van Sant’s My Own Private Idaho? 2. Which of the following actors appeared in Field Of Dreams, The Lion King and Scary Movie 4? Rowan Atkinson? James Earl Jones? Whoopi Goldberg? 3. The aperture of an anamorphic lens is what shape, rather than the industry standard circle? Oval? Rectangle? Octagon? 4. The central alien character in 2002’s Lilo & Stitch was first designed in which year? 1966? 1972? 1985? 5. Who directed Kill List, Sightseers, A Field In England and the upcoming High-Rise? Gareth Edwards? Ben Wheatley? James Watkins? 6. The following is the poster tagline for which film, “Welcome to the bank robbery capital of America”? The Town? Heat? Bandits? 7. Werner Herzog’s Aguirre: The Wrath Of God was released in which year? 1965? 1968? 1972? 8. Which of the following films is not set during World War II? The Big Red One? Judgement At Nuremberg? To End All Wars? 9. Which of the following Oscar winning writers has worked on the most projects (released to date, excluding early, first or otherwise unused drafts)? William Monahan? Aaron Sorkin? Alan Ball? 10. Bob Hoskins came up with The Long Good Friday’s distinctive musical theme. True or False? As with all biopics, there are two reviews to write. The first analysing the film as an artistic narrative and the second as a documentary. Nobody likes the latter. We all know details are inaccurate, exchanges are highly fictionalised and individuals and events are amalgamated. As such, I will try to refrain from bringing up the source material too much; even if it is a huge factor into why this film sort of doesn’t work. Set in 1960’s London we are quickly introduced to Reginald Kray [Hardy], a successful club owner and criminal operating out of the East End. The story is narrated by Frances Shea [Browning], a teenage girl that Reggie became infatuated with and eventually married. The story then introduces Reggie’s criminally insane twin brother Ronald [Hardy]. Ronnie is a keenly intelligent individual but also severely unstable without specific and constant medication. The Kray’s hold over London increases and soon they are left unopposed thanks to a scandal involving politicians from both of the leading parties. Reggie represents the business mindset, intent on establishing a legitimate name for himself as a club entrepreneur, whereas Ronnie has no qualms dealing with people he denotes to be a threat in the only way his gangster mind can. As tensions grow, animosity between Frances and Ronnie becomes more pronounced, causing rifts between the three. 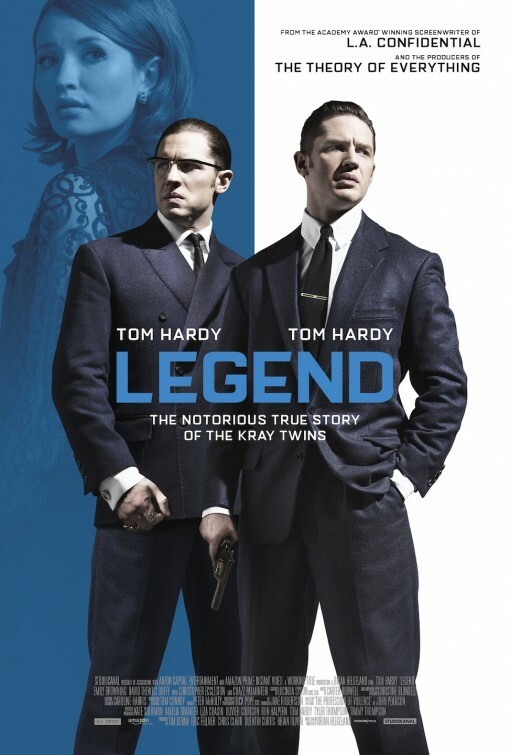 Coming from the director of A Knight’s Tale, it shouldn’t come as any great surprise that Helgeland has taken the life of the Kray twins as a sort of inspirational starting point, rather than an exact blueprint. An equally interesting choice was the specific narrative focus of the story, excluding the twins’ rise to power and any childhood/teenage flashbacks. But by flushing out the trials and tribulations Ronnie and Reggie faced on their way up, we don’t really appreciate the extents of what these men are capable of, not to mention their grip on the East End of London and the celebrity status they achieved across England. And no, a few shots of Reggie being recognised by random people in the street and the overbearing narration confirming that his influence was widespread is not nearly enough. In all honesty, as much as I adore cinema, there are certain stories which simply work better over a prolonged period. And with the success of the BBC’s high-budget Peaky Blinders and Netflix’s Narcos, one wonders if a serialised format would not be better suited to tell this particular tale. But I digress. With a lot of these releases, even when the storytelling is a bit flustered, the technical execution generally steps in and emphasises the mood and setting. Unfortunately the only emphasis made here is to heighten the confused direction. There’s several nice uses of humour but they come at the expense of tension, the editing jumps around a little erratically making it difficult to put a finger on how much time has passed and possibly most jarring, the cinematography is arguably very good but equally somewhat inappropriate. I’m not a fan of the high contrast, desaturated look but in this case, it might have been useful. Films like The Long Good Friday, Lock, Stock And Two Smokin’ Barrels, Layer Cake and Tinker Tailor Soldier Spy make good use of the overall grey look of London. Admittedly, none of these releases are set in the 60’s but the overall cartoonish, slightly Austin Powers aesthetic rings false. Mixing gangland banter with torture and bright setups with random violence, it’s almost as if the film doesn’t know what it is. Are we talking about a gritty exposé of London gangsters or is this a romantic comedy with an unhinged twin? What’s more frustrating is the fact that the locations used and the general production design are incredibly decent. The costumes are period appropriate without going too far down that cravat and velvet road and the hair and make-up feel generally of the time although everyone is far too glamourous for the East End. And finally the icing on the weirdness cake is Carter Burwell’s score. Returning readers will know that I really appreciate the simplicity of Burwell’s stirring melodies; he’s an amazing talent and I’m always happy to see him attached to a project. And yet the music here feels off. At times it’s pitch perfect and really laces the mood but at other times it’s massively over-imposing. If I had to guess, I would assume the intent was to replicate that heavy musical thematic style of something like The Long Good Friday but it just blares out at you like a transitional sting from 70’s TV. I’ve rather intentionally left out discussing the acting until this point, primarily because it’s the real highlight of this film.. sort of. The first thing Helgeland did right was to cast someone who is actually from London as the Krays. Tom Hardy is an exceptional acting talent (obviously) and when he hits his stride with a role he produces something really impressive. And yet, very early on in the design process a horrible decision was made. Anyone who’s seen an interview with the Krays knows they were squeaky voiced East End boxers; short little bruisers with big ears, unintimidating voices and big fists. Some could argue that sort of describes Mr. Hardy. So immediately, he’s perfect for the role and his portrayal of Reggie Kray is absolutely wonderful; wreathed with charm, presence and menace. Then we have Ronnie Kray, the clinically unstable twin. Armed with prosthetic teeth, a baritone voice and a crazy-eyed stare, he’s a bit of a caricature; an extremely entertaining caricature but a hyper-real one nevertheless. Personally, I think it would have been much more effective and interesting to have Reggie and Ronnie portrayed almost exactly the same (with different hair and a pair of glasses to distinguish them) with the unhinged one flying into random fits of rage and absurdity. If only because all the eloquence, humour and obvious intelligence that Ronnie possess feels completely false and unrealistic. Then we have Emily Browning and her narration. Credit to the Aussie, she does a good job with the accent and her slide from innocent teenager to pill-popping depressive is commendable. Having said that, the choice to make her the story’s guide was a weird one. I understand the notion of introducing us to these characters through the eyes of someone on the outside but it also means that with her eventual death the film limps on for another twenty minutes, trying to find a comfortable conclusion. Which it doesn’t. In truth, there isn’t much point discussing the supporting characters, who are relegated to the background. There are a handful of interesting cameos and Taron Egerton as Mad Teddy is impressive enough but really this is a Tom Hardy showpiece. And so one of the most promising releases of the year turns out to be fairly mediocre fare. Like Child 44 all the parts were perfectly assembled but the whole never really amounted to the success that it could have been. For Reggie and Frances’ first date, Reg takes Frankie to his club and introduces her to the secret world of celebrities rubbing shoulders with underground boxers and criminals. It’s one of the rare uses of showing us this world rather than having Browning simply narrating about it. And to top it all off, the whole thing is one long impressive tracking shot, serving to highlight the exemplary organisation of the crew and acting talent of the cast. It’s a shame more of this couldn’t be utilised – probably because of the whole single actor/double role business. As I’ve already discussed Hardy and Browning, I probably need to talk about one of the supporting roles. Which I’m hesitant to do as they either don’t have a great deal of screen time or simply fail to make much of a lasting impression. One of the biggest surprises was the presence of Paul Bettany portraying South London gangster Charlie Richardson. His weird affectation of a mock courtroom robs his introductory scene of any real threat and as soon as he’s introduced, he’s nicked and whisked away just as fast, never to be seen or heard from again.